"A Grim Tale", known as "Genome's Giant" in the Japanese version, is the twenty-third episode of the Yu-Gi-Oh! VRAINS anime. It first aired in Japan on October 18, 2017, became available with official subtitles via Crunchyroll on the same day, and aired in Canada on November 17, 2018. In order to rescue a boy who fell victim to the "Deleted" phenomenon, Gore confronted the criminal who called himself Dr. Genome. Determined to win no matter what, The Gore casts away his entertainment style and Duels like a heel. As there are no monsters on the field, Genome sends a "Helixx" card from his hand to the GY to Normal Summon "Helixx Marmotroll" without Tributing by its own effect. He sends "Marmotroll" to Normal Summon "Marmotroll" (2600/0). Gore Normal Summons "Gouki Suprex" (1800/0). As "Suprex" was Normal Summoned, Gore activates its effect, Special Summoning a "Gouki" monster from his hand. He Special Summons "Gouki Twistcobra" (1600/0). Gore activates the effect of "Gouki Headbatt" in his hand, sending one other "Gouki" monster from his hand to the GY, then targeting a "Gouki" monster he controls to Special Summon "Headbatt" in Defense Position, then the targeted monster gains 800 ATK until the end of this turn. He sends "Gouki Riscorpio" and targets "Suprex", then Special Summons "Headbatt" (800/0) ("Suprex": 1800 → 2600 ATK). Gore sets "Headbatt", "Twistcobra", and "Suprex" in the Link Arrows to Link Summon "Gouki Thunder Ogre" (2200/↙↑↘) to the Extra Monster Zone. As "Headbatt", "Twistcobra", and "Suprex" were sent from the field to the GY, Gore activates their effects, adding a different "Gouki" card from his Deck to his hand. He adds three unknown cards. Gore activates the Equip Spell "Gouki Dark Mask", equipping it to "Thunder Ogre". As Gore controls a "Gouki" monster, he activates the Spell "Gouki Poison Mist", inflicting 700 damage to Genome, also Set Spells and Traps Genome currently controls cannot be activated this turn (Genome: 4000 → 3300 LP). The effect of "Thunder Ogre" allows the turn player to Normal Summon a monster from their hand to their zone "Thunder Ogre" points to, in addition to their Normal Summon/Set. As all monsters Gore controls are "Gouki" monsters, he Normal Summons "Gouki Riscorpio" (2300/0) to the zone the bottom-left Link Arrow of "Thunder Ogre" points to without Tributing by its own effect. "Riscorpio" attacks "Marmotroll", and is destroyed (Gore: 4000 → 3700 LP). As a monster "Thunder Ogre" pointed to was destroyed by battle or card effect, Gore activates its effect, increasing its ATK by 400 ("Thunder Ogre": 2200 → 2600 ATK). As the equipped "Thunder Ogre" activated its effect, the effect of "Dark Mask" activates, inflicting 500 damage to Genome (Genome: 3300 → 2800 LP). As "Riscorpio" was sent from the field to the GY, Gore activates its effect, adding a different "Gouki" card from his Deck to his hand. He adds "Twistcobra". Gore activates his Skill "Pain and Gain", Special Summoning all "Gouki" monsters that were destroyed by battle this turn. He Special Summons "Riscorpio" (2300/0) to the zone the bottom-left Link Arrow of "Thunder Ogre" points to. "Riscorpio" attacks "Marmotroll", and is destroyed (Gore: 3700 → 3400 LP). As a monster "Thunder Ogre" pointed to was destroyed by battle or card effect, Gore activates its effect, increasing its ATK by 400 ("Thunder Ogre": 2600 → 3000 ATK). As the equipped "Thunder Ogre" activated its effect, the effect of "Dark Mask" activates, inflicting 500 damage to Genome (Genome: 2800 → 2300 LP). "Thunder Ogre" attacks "Marmotroll". The attack continues and "Marmotroll" is destroyed. The first time Genome would take battle damage from an attack involving "Marmotroll" each turn, its effect prevents him from doing so. Genome activates the Spell "Graveyard Incubation", targeting two "Helixx" monsters in his GY with the same name and Special Summoning them, but their ATK/DEF is changed to 0, they have their effects negated, they cannot attack or be Tributed, also they cannot be used as material for a Summon, except for the Link Summon of a "Helixx" monster. He targets and Special Summons two copies of "Marmotroll" (2600 → 0/0). Genome sets two copies of "Marmotroll" in the Link Arrows to Link Summon "Helixx Gothiclone" (0/↑↓) to the Extra Monster Zone. 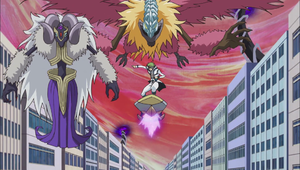 As Genome controls a Link Monster in the Extra Monster Zone, he Normal Summons "Helixx Dreadrat" (1200/2000) without Tributing by its own effect. He Normal Summons it to the zone the bottom-center Link Arrow of "Gothiclone" points to. Genome Sets a card. "Gothiclone" attacks "Thunder Ogre". At the start of the Damage Step, as "Gothiclone" is battling Gore's monster, its effect activates, making its ATK become equal to the ATK of Gore's face-up monster until the end of this turn ("Gothiclone": 0 → 3000 ATK). The first time "Gothiclone" would be destroyed by battle each turn, its effect prevents it from being destroyed. The first time the equipped "Thunder Ogre" would be destroyed by battle or card effect each turn, the effect of "Dark Mask" prevents it from being destroyed. The attack continues and neither monster is destroyed. After damage calculation, as the effect of "Gothiclone" was applied, Genome activates its other effect, Tributing a monster it points to to inflict damage to Gore equal to the ATK the Tributed monster had on the field. He Tributes "Dreadrat" at the zone its bottom-center Link Arrow points to (Gore: 3400 → 2200 LP). As all monsters Gore controls are "Gouki" monsters, he Normal Summons "Riscorpio" (2300/0) without Tributing by its own effect. The effect of "Thunder Ogre" allows the turn player to Normal Summon a monster from their hand to their zone "Thunder Ogre" points to, in addition to their Normal Summon/Set. He Normal Summons "Twistcobra" (1600/0) to the zone the bottom-left Link Arrow of "Thunder Ogre" points to. Gore activates the effect of "Twistcobra", Tributing a "Gouki" monster, then targeting a "Gouki" monster he controls to increase the targeted monster's ATK equal to the original ATK of the Tributed monster until the end of this turn. He Tributes "Riscorpio" and targets "Thunder Ogre" ("Thunder Ogre": 3000 → 5300 ATK). As "Riscorpio" was sent from the field to the GY, Gore activates its effect, adding a different "Gouki" card from his Deck to his hand. He adds and subsequently activates the Quick-Play Spell "Gouki Serpent Splash", targeting a "Gouki" Link Monster he controls whose current ATK is higher than its original ATK and inflicting damage to Gore equal to the difference between its original ATK and current ATK, but Gore cannot conduct his Battle Phase the turn he activates "Serpent Splash". He targets "Thunder Ogre", but as Gore activated a card or effect that would inflict damage to Genome, Genome activates his face-down Trap "Regeneration Cure", making that damage become 0, then Special Summoning a "Helixx Token" (0/0). Genome activates the effect of "Dreadrat" in his GY, Special Summoning it, but it is banished when it leaves the field. Genome sets "Dreadrat" and a "Helixx Token" in the Link Arrows to Link Summon "Helixx Necro Darwin" (1800/←↑) to the zone the bottom-center Link Arrow of "Gothiclone" points to. The effect of "Necro Darwin" prevents Gore's monsters from targeting the co-linked "Necro Darwin" for attacks. "Necro Darwin" attacks and destroys "Twistcobra" (Gore: 2200 → 2000 LP). As "Twistcobra" was sent from the field to the GY, Gore activates its effect, adding a different "Gouki" card from his Deck to his hand. He adds "Gouki Octostretch". As a monster "Thunder Ogre" pointed to was destroyed by battle or card effect, Gore activates its effect, increasing its ATK by 400 ("Thunder Ogre": 3000 → 3400 ATK). As the equipped "Thunder Ogre" activated its effect, the effect of "Dark Mask" activates, inflicting 500 damage to Genome, but as Gore activated a card or effect that would inflict damage to Genome, Genome activates the effect of "Necro Darwin", making that damage become 0, then its ATK becomes double its original ATK until the end of this turn ("Necro Darwin": 1800 → 3600 ATK). "Gothiclone" attacks "Thunder Ogre". At the start of the Damage Step, as "Gothiclone" is battling Gore's monster, its effect activates, making its ATK become equal to the ATK of Gore's face-up monster until the end of this turn ("Gothiclone": 0 → 3400 ATK). The first time "Gothiclone" would be destroyed by battle each turn, its effect prevents it from being destroyed. The first time the equipped "Thunder Ogre" would be destroyed by battle or card effect each turn, the effect of "Dark Mask" prevents it from being destroyed. The attack continues and neither monster is destroyed. After damage calculation, as the effect of "Gothiclone" was applied, Genome activates its other effect, Tributing a monster it points to to inflict damage to Gore equal to the ATK the Tributed monster had on the field. He Tributes "Necro Darwin" at the zone its bottom-center Link Arrow points to. As Genome activated an effect that would inflict damage to Gore, Gore activates the effect of "Gouki Octostretch" in his hand, discarding it to halve the damage he takes from that effect. The effect of "Gothiclone" resolves (Gore: 2000 → 200 LP).